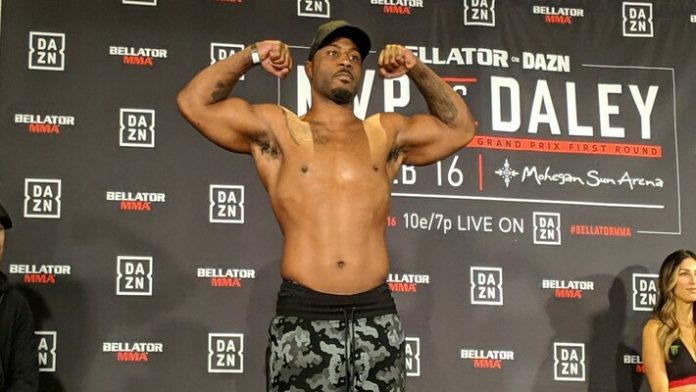 Tyrrell Fortune had some words for Bellator and Jake Hager after his first round finish at Bellator 216. Fortune being one of the blue-chip wrestling prospects has gone 6-0 in his MMA career but has yet to be on the main card of any event. Others that came in through a similar path have been featured on main cards but not him, and while he is still new to the sport, he is not as new as Hager who debuted on the main card at Bellator 214. Fortune got signed the same way Aaron Pico and Ed Ruth were based on their experience in wrestling. While Hager has some real wrestling experience his pro wrestling in the WWE is what fans know him for. As far as Hager’s wrestling goes, “he’s not even that good” according to Fortune. While Fortune wants that fight, he does not believe the matchmakers at Bellator will make it happen and he said he is fine with it. He is at the point where he wants a true test of where he is in MMA and will take any higher profile heavyweight on the roster with the exception of the champion, Ryan Bader. Fortune knows he has to work on his skills in MMA before even thinking about a title but after six wins, feels the time is now to make a name for himself. Fortune finished Ryan Pokryfky in the first round at Bellator 216 and he was the fourth bout of the night. Scott Coker was made aware of Fortune’s request when he addressed the media after Bellator 216 and said they have plans for Hager who fights in Chicago on May 11 but will speak with Fortune about his card placement soon. What heavyweight would you like to see Fortune fight next?